Proact’s new London offices represent a “fusion of good design”. 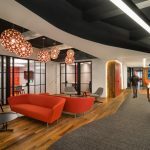 Growing out of its former space, the award-winning storage integrator and cloud service enabler, Proact, tapped Woodhouse Workspace to design its new London offices. Spanning two floors, the new Southwark digs feature open spaces to entertain clients and more secluded places for staff requiring high amounts of concentration. One of the office’s biggest gems is its outside deck, complete with an awe-inspiring London view. What is the address of the project? Who was the interior architect/designer? What is the total square footage? On one floor, there are 41 people in 2,579 square feet. The other floor—also 2579 square feet—is all meeting rooms, as well as and breakout and entertainment areas. What is the location’s proximity to public transportation and other amenities? The office is within walking distance of the Southwark Underground Station, and there are buses just a few steps from the front entrance. Which furniture brands/dealers were used? Please touch upon any notable products, how they were used, and if they solved a specific problem. Furniture specifications varied across the project as the requirements dictated different applications. The client wanted to encourage collaboration for both internal and external users, as well as interaction between the spaces. Overall, we selected specific items that would be suitable for comfort, aesthetics, durability and value. Orangebox supplied reception and task seating, Sven for the meeting rooms, Mobili for the bench desks, Frovi for the high-level items and Cult for the industrial pieces. We also added individual products to suit various needs. The majority of staff are based on site full-time. We designed the space to accommodate full capacity plus 10-percent expansion. This would allow flexibility as they grow and if a mobile working policy was adapted then this would help increase their expansion aspirations even further. The unassigned areas accommodate 60 percent of the total space. This is due to the number and size of the meeting rooms and the breakout areas, which encompass a quarter of a floor. How is the company’s brand reflected in the space? Branding is key to the original pitch. We knew we had to identify and demonstrate the strong brand within the design. Bold color tones and dynamic imagery had to be reflected without becoming overpowering. Defined backdrops with primary tones overlaid created the distinctive look. The concept was to design an environment that was unique—a space that represented who the client was: forward thinking, bold, innovative. The design had to have personality, and the company’s strong brand helped shaped the environment visually— creating a very unique look. The various components are generic but collectively they create this inspiring workspace. In effect, designing a jigsaw and making sure the pieces paint the picture. If the company moved out of a previous space, what was the hardest aspect of change for people? Proact was a relocation project. They were located on one floor and had an “open plan” environment. The relocation enables them to now retain that philosophy across two floors. Although the concept worked previously, more space enabled us to provide additional varied areas to suit particular tasks. We wanted connectivity between areas, but also a balance for those “getting away” moments. We felt changes that were applied helped with productivity. Please share any illuminating, surprising, or hoped-for results you might have gleaned from post-occupancy surveys. The general feedback is what we expected. We knew from the offset we had to engage with the various personnel to understand the requirements, their expectations and their concerns. From concept through to construction, we always had dialogue and updated the client on the various stages and progress of the design. It was a clear transparent process to deliver what the client wanted: an inspiring, bold, flexible and efficient, workspace. Woodhouse Workspaces delivered this. Holistically, the project had notable aspects throughout the space. We think of it as a fusion of good design. 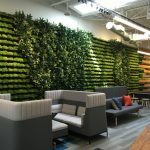 From its flooring designs, feature walls and graphically imaged glass to its exposed ceilings, furniture items and distinctive color tones, the resulting product is the perfect workspace for Proact.